I never knew Kirby didn't like doing Demon. ... Anyway, the Legionnaires get together at the final hour and write a will. I find it interesting that Brainy left his force field belt to Invisible Kid.Invisible Kid is supposed to be very intelligent himself, so maybe there's some camaraderie there. Yes, I-Kid was a scientist, so there was that connection...but when I first read this issue back in the day, I remember thinking hmm, Shooter's making a sly reference to the Invisible Girl, who could turn invisible and had an invisible force field. Hmm, I'd never thought of the Invisible Girl angle. Good catch! Yeah, I knew that Shooter was a Marvel fan. I think Spider-Man was one of his favorite comics, if I remember correctly from some things I read on his blog years ago. Reading Amazing Adventures: War Of The Worlds #23-25 I noticed in the Washington DC set stories an adversary, a black man, named Sabre! And he's sympathetic to Killraven and his cause and ethical code, not a baddie really, and even saves him while bringing down the Lincoln memorial. So wow, this is the first appearance of Don McGregor's great Sabre character! How did he ever get to keep him and do the character for Eclipse comics later? It doesn't seem many fans have noticed either. So wow, this is the first appearance of Don McGregor's great Sabre character! How did he ever get to keep him and do the character for Eclipse comics later? Same name, different characters. The Marvel Sabre is so minor that he has no entry in the Marvel Wikia database. Don took some of the ideas he had in mind for the Killraven series and used them in the Eclipse Sabre, according to some interviews in the 80s. I guess he just liked the name. I read Thor #219, continuing the story of the "Black Starts", giant machines that go around destroying solar systems. It was pretty good ,though the dialogue could have been better. We still haven't met the beings behind the Black Stars, but we meet some of their minions, who despise their masters. We also get a bit of buildup with the side plot of Hildegarde's sister (Krista) and the mysterious stone she found. No doubt Thor will have some trouble with that as soon as he's done whoopin' those Black Stars. I'm still slowly making my way through The Essential Thor, Volume Five. After Ulik's invasion of Midgard (in #210 and #211, which I liked a lot), I've hit another run that isn't doing a whole lot for me. I finished #216 this morning. 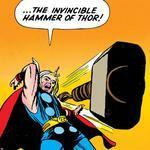 The last few issues have had all of Asgard (including Odin) defeated, enslaved and put up for auction (!) by insect aliens! Then Mercurio returned and there was this giant space jewel that Mercurio needed to save his planet! But Sif and Hildegarde were trapped inside the jewel! And the jewel created a giant humanoid body for itself and named itself Xorr! So everybody had to fight and it really isn't that good. Also, the Colonizers of Rigel are involved somehow. I finished Wonder Woman: The Golden Age, Volume One, a few nights ago. Wow! The more early Wonder Woman I read, the more impressed I am with William Moulton Marston as a writer. Yeah, he was a bit of a whacko, but some of these stories are amazing! Highly entertaining! I especially loved Wonder Woman #3. Four stories about Wonder Woman's conflict with the Baroness Paula von Gunther. The first story takes place largely on Paradise Island where it's Amazon Christmas! Instead of Santa Claus, one of the Amazons pretends to be Diana (the goddess, not Wonder Woman) and traipses about the island. The other Amazons have to try to find out who is impersonating Diana, but if you fail, you have to dress as a deer, and the next day, if you are captured as a deer, you have to lie down in a giant pie with all the other captured Amazons masquerading as deer. If you have read early Wonder Woman, you know I'm not making this up! In a later story, Diana Prince is vacationing in a snowy area and guess who is also in the region? Why, it's the baroness, driving around recklessly and trying to run over the sledding children because she's evil and German! 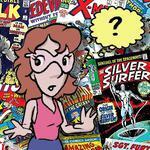 Later developments in the issue turn up the facts about the Baroness. Her daughter is being held by the Nazis and she is being forced to commit acts of espionage to save her daughter's life. Her frustration has made her lash out at American children! So Wonder Woman, armed with this new knowledge about the baroness, saves the day and persuades the baroness to renounce her Nazi ties and reform! Yay, Diana! Take her to Paradise Island, introduce her to the ways of loving submission and then get her to roll around in a pie! I read Marvel Team-Up #67 and #68 last night, featuring Spider-Man teaming up with Tigra and Man-Thing respectively. Both issues were written by Chris Claremont and drawn by John Byrne, but MTU #67 is by far the best issue of the two. It follows the standard MTU set up of having the two heroes fight each other first, as the result of a misunderstanding, before teaming up to fight the villain. 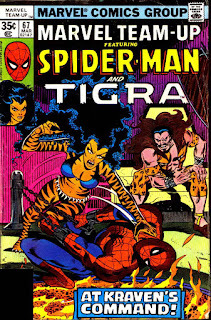 But the twist here is that Tigra is being mind-controlled by Kraven the Hunter, who wants to use her animal ferocity to kill Spider-Man because...well, because of honour and stuff! I'm not sure quite how much "honour" there really is in drugging your opponent and then getting someone else to kill them, while you watch, but there you go! Anyway, it's a fairly lightweight story, as issues of MTU often are, but there's still plenty of action and Byrne's art is certainly nice to look at. All in all, this is a decent Bronze Age read. MTU #68, on the other hand, is less impressive overall, but at least it has a slightly more original start to the story. Peter Parker is out on a date with Mary Jane at a circus, when he sees Man-Thing (who he last met in an Giant-Size Spider-Man #5) imprisoned in a glass tank and being exhibited as a circus attraction. Peter does the decent thing and returns Man-Thing to his home in the Everglade swamps, but that's where things take a turn for the weird. 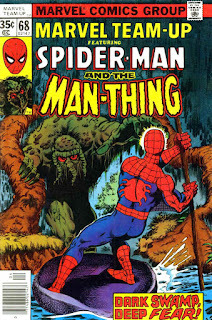 It turns out that Man-Thing was captured by the circus while battling a being called D'Spayre, who he straight away engages with again, but this time with Spidey's help. But whereas Spidey sees D'Spayre in a disused shack, terrorizing a couple of ordinary local people, it turns out this is just an illusion and the shack is actually a mystical tower from another dimension and the two victims are actually Dakimh the Enchanter and his apprentice, Jennifer Kale. Needless to say, it all gets sorted out in the end, with Spidey beating D'Spayre to a pulp, but this comic sure has a weird ending. That's a shame because, actually, the start, with the rescue of Man-Thing, was really quite strong. I read The Braves & the Bold #149, with the Teen Titans. This occurred in 1979, after their series had been ended, and they had broken up. This story was better than I expected. 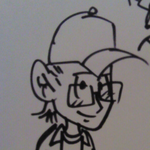 The Titans go undercover to get to the head of a gang of teenage runway crooks. I also read Showcase #100. This star 60 characters that have been featured in Showcase. They team up to save the earth! This story was a lot of fun, in spite of some questionable moments, such as Lois Lane and Angel (the ditzy blonde from Angel & Ape, not the X-Man) defeating some killer robots. I also read Adventure #380, the last time the Legion was featured in Adventure Comics. It was OK, but not one of Shooter's stronger Legion efforts. I should be getting a Showcase #100 soon, am oping Dolphin and Anthro are in there someplace, and maybe Enemy Ace too. I know they had Dolphin and some other sort of forgotten at that time characters like Animal Man in some '80s Action Comics as I remember the great Gil Kane artwork vividly. In contrast I had that last Legion in Adventure and remember nothing about it. 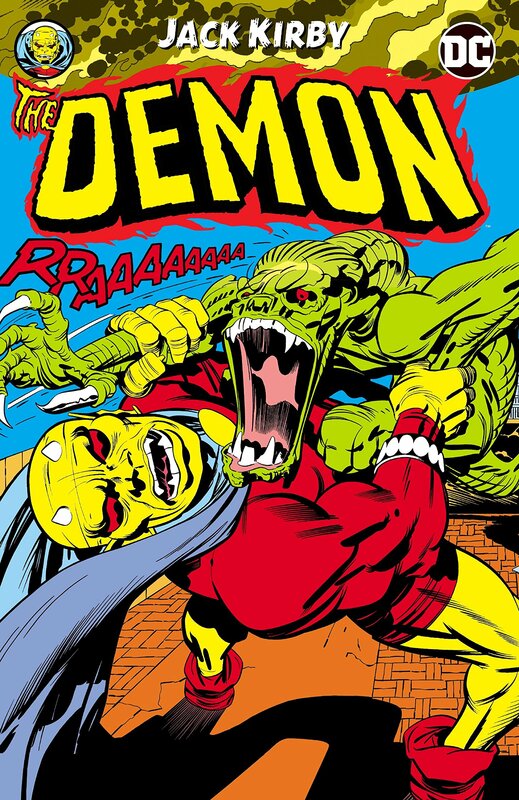 The Demon Volume 1, Issues 1-16. What is Klarion like here? I have only read him from more recent stories? Is he is standard villain or a brat? Dolphin and Anthro are in it, though only briefly. Enemy Ace is in it, barely. I only remember seeing his plane in one panel. No Animal Man. I should be getting a Showcase #100 soon, am oping Dolphin and Anthro are in there someplace, and maybe Enemy Ace too. All three do appear. The issue is said to include every character who had a feature in Showcase #1-99, give or take Nightmaster and James Bond.